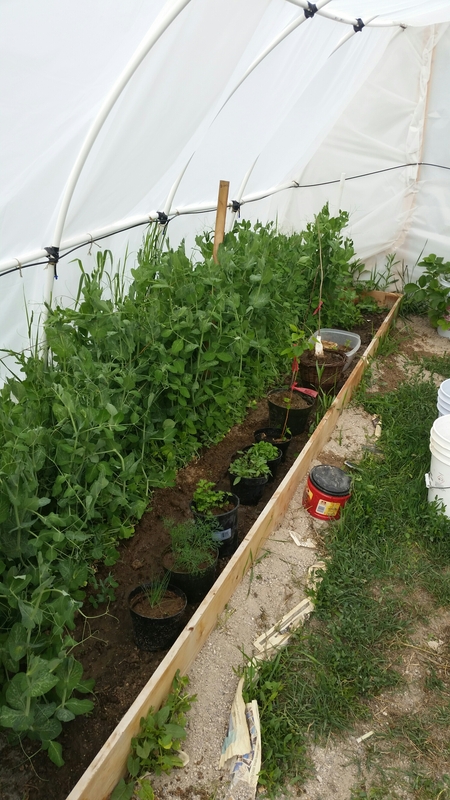 I checked inside the hoop house this afternoon abs our peas are waist high! I was worried about them for a bit because they haven’t bloomed yet, and I planted them way back in March, but upon some research it’s not unheard of in zone 5. So I have been patiently waiting. Today we have the starts of some tiny blossoms! I can’t wait for those delicious little pods, we love peas at our house. 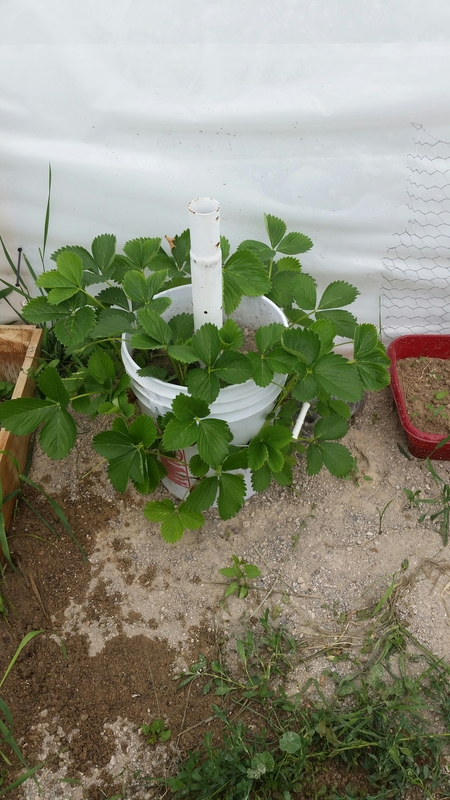 Our vertical bucket planter my husband made for our strawberries is working quite well! We kinda made it as a “trial” to see if we could get them to bounce back. We had them along the west side of the house, where they did okay, but the birds ate more than we did. So we plopped them into this bucket planter. They are thriving! The leaves are almost the size of my palm! I won’t be surprised if we don’t get any berries this year, because we moved them, but it may have been early enough. Time will tell I suppose. 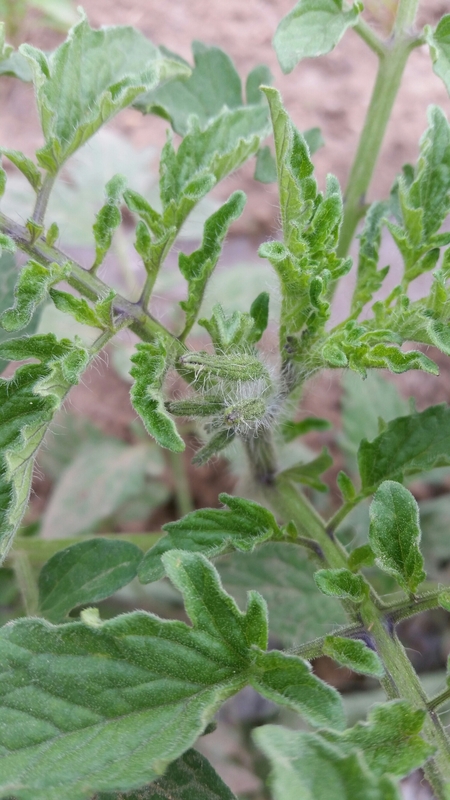 This is perhaps the most exciting development, we have tiny blossoms forming on the tomatoes! I will tell you that my mother in law Ave I are the only two people at our house that way them, unless it’s in salsa or spaghetti sauce, but seeing these always gets everyone excited. These little tomatoes, let me tell ya, it’s been a heck of a journey. I started then from seeds back in February, in my little jiffy pods. When I bought them Scott rolled his eyes and said “great, now that thing is going to take over the kitchen table” to which I simply grinned and continued selecting seeds. When I started them in February he also laughed Ave said “don’t you think you’re jumping the gun a little bit?” I think he was right with that one, they grew so slowly! I thought they would never sprout. When they finally did, they wilted a few days later. It was disheartening to say the least. I finally got them into 3″ pots, then got topsoil put into the greenhouse. It was at least 2 months at that point, and more than one time I had been sure they are dead. After putting them into the greenhouse they wilted again. I wanted to cry, just buy new plants from the nursery and cut our losses. But a couple days later they perked back up. Now they are his, and ready to give us some produce. I won’t say anything else, I don’t want to jinx myself! I didn’t have my phone or camera when we checked the bees today, but I was absolutely thrilled to see our fat little queen happily working away. She looked amazing, and we have 2 full frames with capped brood. We should have some new workers and drones emerging any day now. I’m looking into a pollen collector, if anyone has any experience I would love to hear about it. Today I started my day job back at full time hours. It was brutal, and though I’m unbelievably grateful to have steady paychecks again, it means I don’t get to work the second job I have genuinely loved for the couple months I’ve been there. One day I’d like to have that he my full-time job. It was a crazy long day, I’m so tired, and I have to deal with my boss tomorrow. It’s kind of a down note, and my anxiety is pretty high (if you guys don’t know, I have dealt with bipolar disorder for most of my life). I will check in with you guys later, thanks for popping in!